Children Inspire Design is an art based product line of modern, eco-friendly and culturally diverse wall art, wall cards, maps and posters for children, full of whimsy, and designed to help children learn compassion for our earth and all who inhabit it. Children Inspire Design is offering a FREE DIY Global Family project to encourage and enableÂ parentsÂ to use compassion to talk theirÂ children about the refugee crisis. 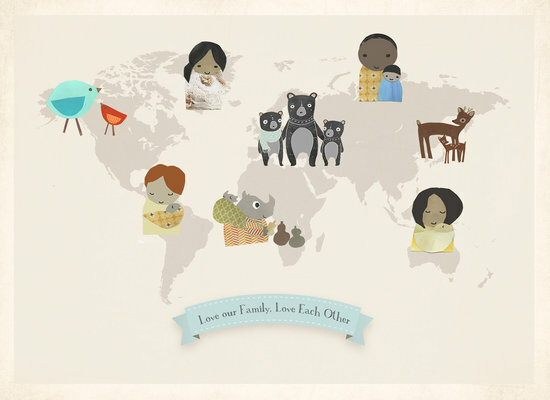 The DIY printable, which includes a world map + cut out images, is a tool to help parents to start talking to children about families around the world, so that they can process the facts and perhaps find a common connection to refugee families. Check it out at the Children Inspire Design Blog!